“Wilderness Roundup” is a breathtaking work of art. On one side, a cougar shares a drink in a shimmering pond with a deer and rabbit. On the other, a bighorn ram gazes magisterially towards a bobcat and raccoon. Birds and butterflies flit about, and oversized flowers, autumn leaves and snowflakes suggest seasonal changes in a complex wilderness environment. The beauty of the design is enough to inspire admiration… which turns to awe when you learn that the artist is a quadriplegic bound to a wheelchair. A native New Mexican, Mitzie Bower expressed her creative spirit at a young age. She preferred sitting by herself drawing and coloring to playing with other kids. She sewed her own clothes and made her own shoes. The opportunity to be creative motivated her in all aspects of her life, which led her to gymnastics, which she considered an art form that was expressed by her body. It was 1975 and she was performing her last dismount of the day from a balance beam when she lost her concentration and “wiped out”, landing on her head. The results were tragic. Paralyzed from the shoulders down, she would never walk again, nor move her hands or fingers. But amazingly her ability to breathe without assistance was not impaired, and she retained a limited range of movement in her arms. 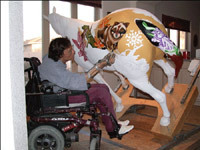 That, and an upbeat, can-do attitude would be all she needed to move forward with determination not to let her handicap limit her life, or interfere with her art career. 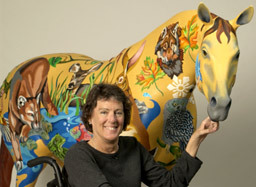 Mitzie completed high school and received her degree in Fine Arts from the University of New Mexico. 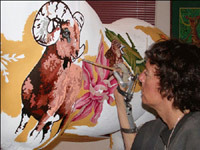 She landed a job as a computer illustrator at Sandia National Laboratories in Albuquerque, and continued to pursue her artistic hobbies: macramé, pyrography, ceramics, sculpture. She was such an inspiration that the hospital where she had been treated would invite her back to counsel patients with similar injuries, which is how she met her husband. She was told a young man’s car had slid on an icy bridge and crashed and that he had lost the use of his legs. It was Valentine’s Day and Mitzie showed up at the hospital with heart-shaped cookies, only to be told, “Buzz off.” So she did, but months later, when he was released from the hospital, the young man called to apologize and the two became friends. In 1991, Mitzie and Tim Bower were married. What is an enormous task for any artist became the biggest challenge of Mitzie’s artistic life. 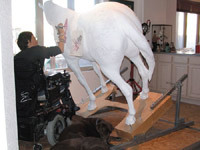 After she convinced the organizers of The Trail of Painted Ponies that she deserved a chance to paint a 5-foot-tall 7-foot-long horse sculpture, her husband invented a tilt-table that allowed Mitzie to tip the model at a 45 degree angle, enabling her to reach and paint the entire body surface while still in her wheelchair. 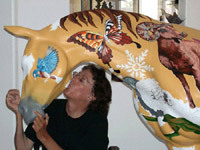 Then, aided by a prosthesis to help hold her brush, she began to paint her Pony, one stroke at a time. "Wilderness Roundup" an original life-size sculpture. "Wilderness Roundup" a collectible figurine inspired by Mitzie's original Pony "Wilderness Roundup". Biggest Artistic Influence: Henri Rousseau, Marcel Duchamp, Franz Marc, M.C. Escher, and the Native American artist, Helen Hardin. I was leaning towards impressionism when I learned about her and I admired the sense of geometry in her art… as well as her struggle with cancer. Favorite Song: “Let It Be,” by the Beatles. Favorite Color: I don’t really think of it as a color, and it would appear to go against the appearance of my artwork which has a lot of color, but I like to work with black. I do a lot of pen and ink drawings. Favorite Words of Advice: “Faith. Patience. Time.” If you have faith – and it doesn’t matter whether it’s religious or personal – it can get you through most anything. You’ve got to have patience because if you don’t you lose – with people, in traffic, in life situations, and things take time. With what I’ve had to go through, things definitely take time. You need to have all three if you are going to accomplish something significant in your life, and I believe painting this Pony challenged all three. I had to have faith in my ability to paint on a large-scale 3-dimensional canvas. I needed patience to commit myself to a deep-rooted impulsive desire to push my skills to the limit. Finally, it helped to have foresight of the time it would require to transfer the essence of myself onto such a massive surface. Personal Hero: Tim, my husband. He is my hero. I’m not the easiest person to get along with, but he married me and he has stayed with me. He too has had to overcome a disability, and he has accomplished amazing things. Once he puts his mind to it, anything is possible. 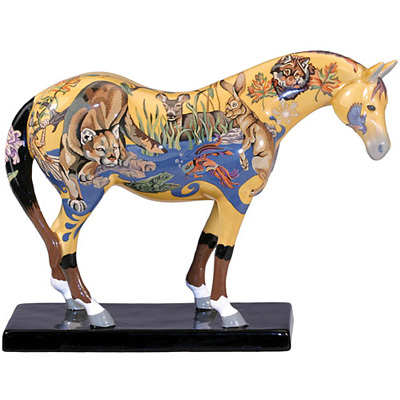 If you are interested in purchasing this fantastic work of art, contact: rod@trailofpaintedponies.com.